BugHunter™ Professional BH-02 Rapid bug detectoris a digital portable device designed for detecting radio transmitting devices in close proximity — wireless spy bugs, radio microphones, hidden wireless video cameras, two way radios, switched on cellular phones, cellular signal jammers and suppressors. 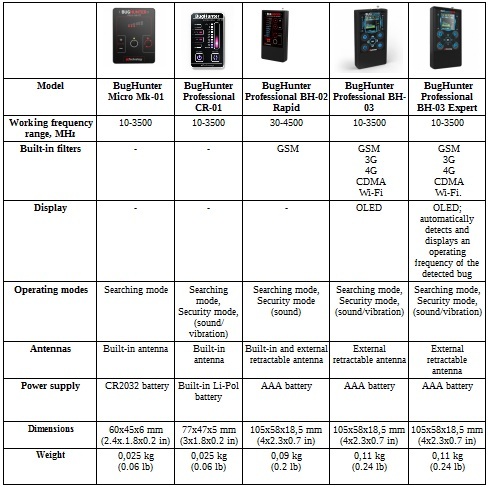 In comparison to its predecessors, bug detectors BugHunter Professional BH-01 and BugHunter Professional BH-02, it possesses a significant advantage — increased frequency range(from 30 to 4500 MHz).This allows to expand the range of eavesdropping devices that can be detected by the device. • Integrated GSM-filter.In today's world GSM towers are ubiquitous — they can be seen both in large cities and small provincial towns. This greatly improves the quality of cellular communication but it significantly impedes detection of spy bugs. Cellular towers are a source of strong radio signals and they obstruct radio environment with interferences. Even a high quality bug detector might not always find spy equipment in close proximity to cellular towers because it just would not «see» it. We have taken this into consideration during the development of BugHunter Professional BH-02 Rapid and incorporated a GSM filter into our new model. It reduces interferences of cell phone towers to a minimum, which allows to use the detector even in very close proximity to them. This development noticeably expands the application range of the device and increases the quality of detecting radio bug installation locations. • Increased dynamic range(48 dB). Dynamic range is one of the most significant characteristics of a bug detector, along with the sensitivity. The wider the dynamic range is, the better the device detects signals of very high and very low power and avoids exceeding its operating scale range. This is especially important in difficult search conditions when strong signal transmitters (such as cell phones) and weak signal transmitters (practically all kinds of spy bugs) may exist next to each other. A bug detector with a wide dynamic range would not run off-scale because of a cell phone presence and will be able to discover a hidden spy bug. • Improved modern construction. In the process of design and development of BugHunter Professional BH-02 our engineers took into consideration remarks and comments of our Russian and international end users. BugHunter Professional BH-02 Rapid received a new contemporary visual design. Precise matching of declared characteristics. We guarantee that our device complies with the declared characteristics by 100%. High-quality element base. The device is assembled manually with high-quality components from distinguished European companies. Operation in the frequency range from 30 to 4500 MHz. The bug detector covers the whole frequency range utilized by hidden video surveillance and eavesdropping devices. It has a built-in and an external (for low frequencies) antennas. Stabile operation in the whole declared frequency range. Due to the utilization of innovative technologies, BugHunter Professional BH-02 Rapid bug detector consistently works in the whole declared frequency range, without any failures. High sensitivity — the device has a very high sensitivity of 50 mV/m. It discovers a standard radio spy bug with 5 mW power from a 5 meter distance (16 ft), and it discovers a high power cell phone signal from 50 meters (164 ft). For comparison: sensitivity of the most spy bug detectors that have flooded the Russian market rarely exceeds 100 mV/m, which means their detection quality is at least two times worse. High-speed microprocessor base ensures equally efficient detection of both analog and digital spy bugs. Automatic adjustment to the background noise of radio emission — it allows the device to ignore the background noise (which is present at any premises with electronic equipment) and detect only spy bug signals. Expanded operational temperature range (from -15 to +40 °C / 5 to 104 F) allows to use the device in any weather conditions. Earphones and latent warning connection capability — it allows to control the environment independently from surrounding people. Expanded frequency range from 30 to 4500 MHz. It allows to increase the range of detected eavesdropping devices. There are three modes that the device can operate at: security, acoustic binding (search for microphones) and Searchfor spy bugs. In this mode the device utilizes light and sound indication. The closer the device is to the signal source, the higher the level on the scale is. Sensitivity level of the bug detector is adjustable. In the security mode the device switches into low energy consumption and adjusts sensitivity automatically. This mode is used for constant background operation. BugHunter Professional BH-02 Rapid will adjust to the current radio environment by itself. If the device discovers a spy bug in this mode, it will warn you with a sound or light indication, depending on the settings. Acoustic binding is a situation familiar to all radio listeners: when they call to the radio station without turning off the receiver, they will hear a distinctive whistle. It occurs when a speaker playing what is being said to the microphone is located near that microphone. Acoustic binding is used for detecting hidden analog microphones. The detector generates a sound signal. Having received detector's sound, the spy microphone transmits it into air which is detected by the device — and we hear that distinctive whistle.